​An American & Civil War History Experience! ​Relive American & Civil War history through a packaged tour with the Lincoln Train Museum & Gettysburg History Center. 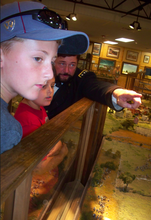 Explore the Gettysburg civilian experience at the Heritage Center. ​Begin your tour at the Lincoln Train Museum where you will experience the spirit of the men and women who achieved our American independence and freedoms as you journey through the history of our nation with President Abraham Lincoln. Enjoy American history presentations and collections, interactive train layouts, President Lincoln's Funeral journey, a ride on our recreated funeral car United States, hands on activities and more! ​See the entire 6,000-acre battlefield at one time. With over 20,000 hand painted soldiers, horses, cannons and buildings, the Gettysburg Diorama includes a thirty-minute light and sound show of the three-day battle of Gettysburg from the first shot fired to the last moments at the high water mark of the Confederacy. Sit back and watch as the three days of battle play out before you. A must see to understand the Battle of Gettysburg. ​Stand face to face with those whose roles shaped and created the battle of Gettysburg at The Spirit of Gettysburg. See and hear General Lee, Jennie Wade, Abraham Lincoln, Joshua Chamberlain and other historical figures as they relive their parts in the Battle of Gettysburg. Experience Pickett’s Charge as if you were in the midst of it and enjoy the wonderful George Lomas collection of Civil War weapons, swords and artifacts. ​Experience what life was like for Gettysburg civilians before, during and after the battle of Gettysburg at the Gettysburg Heritage Center Museum. An educational and inspiring experience. Enjoy some lunch and shopping on Steinwehr Ave. With over fifteen restaurants along Steinwehr Ave. you are sure to find dining to suit your group's appetite. Walk off your meal as you take time to enjoy the more than 20 unique gift, history and souvenir shops of this "Destination Within A Destination". Stepping in time with a two day experience! Finish off your day with a Ghost Walk or Presentation with the Farnsworth House Civil War Mourning Theater & Ghost Walks, ​the home of Gettysburg's longest running ghost tour company. ​Visit The Shriver House and experience what life was like before, during and after the Battle in the civil war home of George, Hettie, Sadie and Mollie Shriver. Visit the Jennie Wade House Museum where Mary Virginia “Ginnie” Wade was killed by a stray bullet on July 3, 1863. She was the only direct civilian casualty of the battle of Gettysburg. The Jennie Wade House Museum remains much as Jennie must have known it more than 150 years ago. Experience Gettysburg’s Battlegrounds through one of our many battlefield tours or add some excitement to your journey and experience Gettysburg with a local historian! ​Experience the beauty and history of ​Gettysburg's battlegrounds with a Licensed Battlefield Guide. 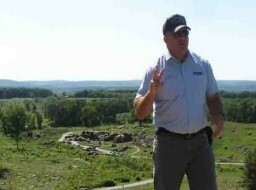 ​Gettysburg's guides bring to life the history of one of America's most famous battles. 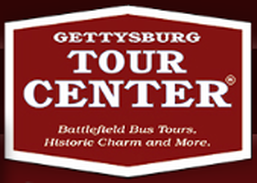 Guides offer walking tours, tours on bicycles, horseback, Segway and mopeds as well as bus tours including those sponsored by the local Gettysburg Tour Center. Places Through Time Living History, Inc. Licensed Town Historians can customize a tour for your group or you can choose from the Walking tours listed on their web site. ​USMC Gunnery Sgt., Retired, Kenneth Serfass as Gettysburg's General Grant. 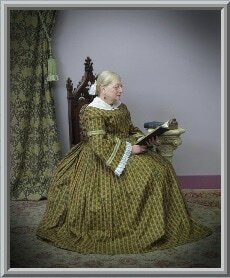 Living History personality available for tours, groups and special events.